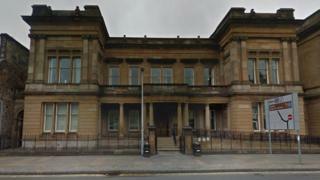 A woman has admitted biting part of a man's ear off during an argument in a taxi queue in Renfrewshire. Paisley Sheriff Court heard Linda McKillop, 35, bit into Alan Brogan's ear and spat it out following a row at a rank in Paisley. He underwent surgery to reattach the damaged tissue but it had to be removed again a week later. McKillop pleaded guilty to assaulting Mr Brogan, 41, by biting off part of his ear, leaving him scarred for life. The assault took place in the early hours of 21 October last year in Paisley's County Square. Mr Brogan had been on a night out in Glasgow and got the train back to Paisley. McKillop walked straight up to the rank and straight to the door of a taxi when it pulled in, despite the fact Mr Brogan was first in the queue. The pair began arguing and the taxi drove off before McKillop, who was drunk, lost her temper and lashed out. Mr Brogan tried to walk away but McKillop ran at him, scratched him on the face and then grabbed him by the head before biting him. The attack was captured on CCTV and showed Mr Brogan putting his hand up to his ear. Procurator Fiscal Depute Alan Parfery said: "The accused was biting his ear off - his upper ear, off. "He then had to strike her to get away. "He raises his hand to his right ear and the accused makes off. "The ear was spat on to the roadway - there was blood." The court heard the attack has had a lasting impact on the victim. Mr Parfrey added: "Mr Brogan has altered his haircut so it covers both ears to try and hide the permanent disfigurement he has suffered." The court heard McKillop was so drunk she phoned police and told them her ear had been bitten off - before telling officers she had actually bit someone else's ear. Defence solicitor Amy Spencer said she admitted her guilt to police almost immediately. Sheriff Seith Ireland called for background reports to be prepared ahead of sentencing. He said: "You have pleaded guilty to a very serious offence indeed on the unfortunate Mr Brogan. "All options, including a sentence of imprisonment, are open to the court." McKillop will be sentenced next month.